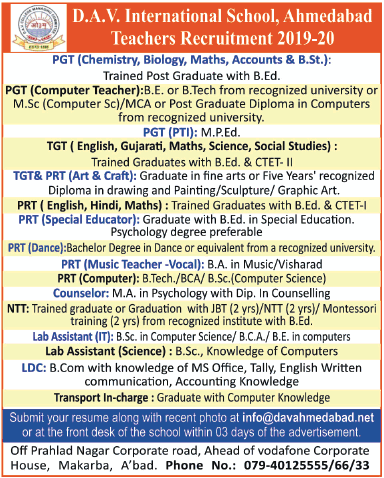 DAV International School, Ahmedabad, Gujarat advertised in Times of India for the Teachers recruitment 2019 – Teaching Jobs/ Non Teaching Jobs . For More Details see below. About School: Dayanand Anglo vedic School is a school with a difference! We value individualisation, Creativity and innovation and strive to nurture them in our students. DAV International School, Ahmedabad believes in creating Happy and Empowered students. We have a vision to incorporate life skills based education through collaborative approach to learning. Children are exposed to immense experiential activities wherein each child learns by ‘mode of doing’. Upgrading knowledge of teachers and parents is needed to match up with the academic, emotional and social needs of the students. We regularly conduct workshops and brainstorming sessions for parents and teachers, who in turn, shower the experience for children’s overall development. The student leadership is given utmost priority. The ‘Mentorship’ programme is highly successful in building student’s and teacher’s leadership. We have a vision that education should be linked with real world outside the school boundary. My focus is to create a school where students are connected to the real world and contributes meaningfully to the society.